Jerry: What was the early Rock and Roll scene like in Dothan? Robert: As far as I know the entire Rock & Roll scene in Dothan centered around John Rainey Adkins house on West Main Street. In '58 and '59, that's where it was happening. If the Adkins had a TV set, they didn't turn it on very much. Every evening you could hear music coming out of that house. My grandmother lived on Jeff Street across Porter's Woods from John Rainey's house. My grandfather died on Halloween day of '59 and I moved in with my grandmother to keep her company. She spoiled me rotten so I always had money to go to Northcutt's Drug Store where there was a soda fountain and a comic book rack. It was located just across the gully from John Rainey's house so I made it a habit of kind of playing peeping tom in the Adkins front yard so I could hear the music. At Dothan High, John Rainey, Buddy Buie, Bobby Goldsboro, Amos Tindall, Gerald Hall and Dave Robinson had gotten together and formed Dothan's first rock band, The WEBS. There were other places that could have had rock music but I was too young to know about it. Napier Field had been an air base during World War II so we had a string of dead end clubs out toward Grimes and some more toward Ft. Rucker in Wicksburg. All the guys in the Webs knew what was happening out there and I'm sure some of those musicians inspired the WEBS. Robert Register just finished watching DHS Class of '68's Jimmy "Joe Willie" Parkman's outstanding performance tonight on MSNBC's AMERICAN GREED. He deserves an Emmy! Fame concert with a solo rendition of "Great Balls of Fire." & I'll take care of you as you hit all the media. the cellar of the Demopolis Hotel with Archie, Paula & friends. BAILEY. A SWEET, AND BEAUTIFUL LADY THAT I HAVE ALWAYS HELD THE MOST RESPECT AND REVERENCE FOR. THE WIFE AND LIFE-LONG SOUL MATE OF MY VERY GIFTED FRIEND,BARRY BAILEY. SHE HAS NEVER HAD A NEGATIVE OR DEMEANING VIBE AROUND HER. A TALENTED MAN AND DESERVES YOUR GRACIOUS ATTENTION. HAVE DONE GOOD WORKS ON THIS EARTH. THEM WITH YOUR MERCIFUL WILL. HELP US ALL TO UNDERSTAND WHAT YOUR WILL IS. I will use this blog to explore the connections between West Florida and Zero. just learned that Topper Price has just died in B'ham. to help with the burial costs. He had no assets or insurances." Harp player and vocalist Topper Price has played with Dickie Betts of The Allman Brothers Band and continues to make guest appearances with artists such as Lynyrd Skynyrd, Albert Collins, and The Band, as well as countless regional acts like the Subdudes, The Radiators, and most recently Brother Cane. For more than 20 years, Topper has performed in bands like Cowboy, The Convertibles and others. 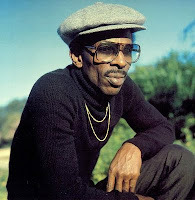 Topper currently performs with his band the Upsetters at venues and festivals across the southeast, such as the Howlin’ Wolf Blues Festival in West Point, Mississippi. This term "flock of gnats" really captured my imagination because I used to use it with Topper Price ever time I'd see him. Man, I hugged his neck at the Crawfish Festival last month. it looks like a flock of gnats!" IT APPEARS THAT I'M HITTING ON AT LEAST A COUPLE OF CYLINDERS!! MAGIC ALEX HAD A WORKSHOP(GUITAR SCIENCE LAB) OFF PICCADILLY SOME PLACE. JIMMY PAGE TOOK US THERE AND PAGE ALSO GAVE ORBISON A BUNCH OF HOTROD PARTS FOR A VINTAGE STRATOCASTER HE HAD. It appears that Nix does actually have some memory cells left. Jimmy Page gave John Rainey his personal "Tone Bender" the precurser to all of the Fuzz Boxes. In an article about the Candymen in the New York Times the writer mentioned how we used no special equipment other than the aforementioned ToneBender. Now let's see how I'm holdin' up. We did in fact also have the first Marshall Amps in the US, given to us when Jim Marshall was still making them in his garage. If we were so cool,why weren't we more successful? BTW you're too funny Al, and the book was a masterpiece. I'd like to write one as well ,but it wouldn't be as interesting, and I'd hate for my kids to read it. they make it worth it to live here. Most days we got it better than Panama City." When I got back to the crib wid the groceries, I found my Topper Price business card. I called the number at the bottom of the card and his fiance Kelly answered the phone. B'ham are doing that but she wouldn't be there. I said,"Well, Topper loved the Nick at Happy Hour." "Yes, he did," she replied. We had a wonderful conversation and folks, Kelly needs to be in our prayers right now. I fryzzzzzzzzzzzzz the bestest skrimpfish dat exisk in dah whole damn world. Prudhomme redfish magic & garlic powder on 'em and soak 'em in buttermilk then dredge em in crushed saltines and Fish Fry. I laid around watching TV and napping until 'bout 5. Gotta a nice phone call from California and then I set off to maybe do some fishing. Please go to this for me & think about writing me a report. Tim McGraw PUT Apalach on the map in 2009!!!! & Douglas will become our new anthem. Another very cool Thomas, McCree, Thomas number, the vocalist on here, everybody seems to agree (except Huey Meaux, who says he never heard of him), is a guy named Big Ben Atkins. 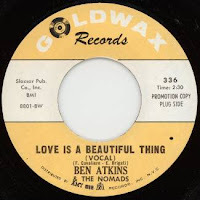 Atkins came up out of Vernon, Alabama (the same town that gave us Dan Penn), leading a college circuit band called The Nomads, mining the same territory as Penn's Pallbearers. 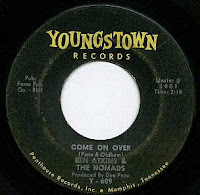 He cut his first single at Fame, a double sider of Penn/Oldham tunes that was actually produced by Dan, and released on original American Sound partner Seymour Rosenberg's Youngstown label in Memphis. Singles on Statue and Goldwax would follow, before he wound up at Grits n' Gravy. It certainly seems odd that Atlantic would agree to put out a record on a guy with an established 'name' out there on the street under a different moniker, especially seeing as how there were in reality two different Andy Chapmans on the same record. Like Tommy Tate said, this was also probably cut as a demo, and shopped out to Wexler who remained unaware of the ruse. I wonder what Huey would have done if it was a hit? Quinton Claunch leased a couple more 45s to Josie, before Ben was picked up by Stax, who released the critically acclaimed Patchouli LP on their Enterprise subsidiary in 1971. Produced by Bobby Manuel and Duck Dunn, it was cut at Muscle Shoals Sound, and broke into the top 100 on the Billboard album chart that year. Like most white guys singing R&B in the late seventies, however, he ended up getting lumped in with the 'Country' guys (just like our friend Len Wade), and his biggest hit would come on the Country charts with We Don't Live Here, We Just Love Here in 1978. 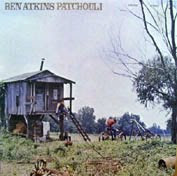 Ben Atkins cut an LP per decade in the eighties and nineties, and is still around. According to his website, he is now performing as a founding member of The Class of '65, "...a complete show and dance band with a rhythm section, four piece horn section, light show, and female background and lead vocalists." 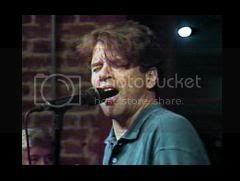 His early material routinely fetches big bucks on eBay, and his own hard driving brand of 'blue eyed soul' still holds up today, as evidenced by this rockin' side that Huey Meaux produced on him over forty years ago (even if Huey doesn't remember it). Shelby S. Singleton, Jr. passed away this afternoon, a victim of the agressive cancer that had spread throughout his body. An absolute giant of the music industry, he never forgot where he came from. 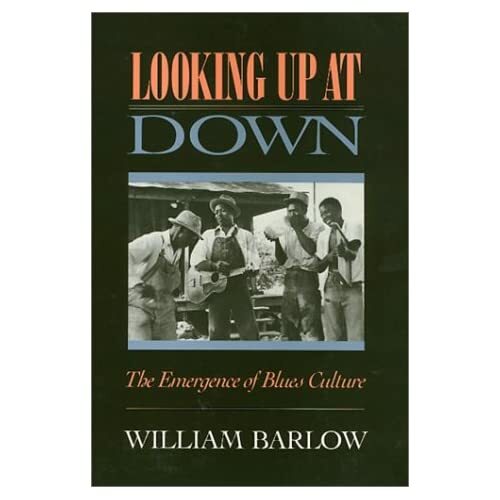 From his work with folks like Brook Benton and Dinah Washington at Mercury, to the initiation of the big company's Smash subsidiary in 1961 (when Huey Meaux brought him Joe Barry's I'm A Fool To Care), to his own Plantation and SSS International labels (along with its own various subsidiaries like Silver Fox and Minaret), this was a man who knew a good record when he heard it. One of the original, seat-of-the-pants 'record men', he told John Broven; "A good promotion man was one that could stay up for two or three days, could outdrink everybody, still be up when they were all on the floor, and could outeat everybody. Just complete workhorses, that's what we all were." Singleton's Louisiana and East Texas roots ran deep. He was the guy who broke records like Sea Of Love, Hey Paula, Breaking Up Is Hard To Do, Chantilly Lace, Running Bear, and on and on in those early days. He had a knack for listening to what the local disk jockeys and juke box operators had to say, and taking it nationwide. 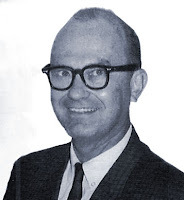 Just as with Huey Meaux (who brokenheartedly described him to me this afternoon as 'more than a brother'), Shelby was lifelong friends with Henry Hildebrand, Jr (pictured above), who ran one of the largest record distributors in New Orleans, All South. It was Hildebrand who turned him on to the work that Wardell Quezergue was doing on his own Watch label with Johnny Adams. 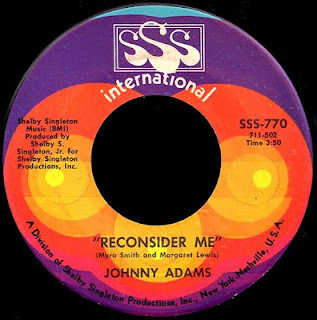 When Shelby started up SSS International, he leased Johnny's cover of Release Me from Watch, and took it into the R&B top forty in early 1969. Genuinely impressed with Johnny's unmatched vocal talent, Singleton pulled out all the stops and brought him to Music Row to record this fantastic record we have here today. 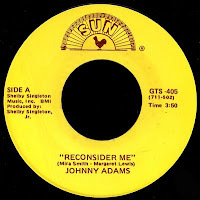 Written by his old friends from the Louisiana Hayride days in Shreveport, Mira Smith and Margaret Lewis, Shelby's production helped make this Johnny's biggest hit, and one of the all-time great 'Black Country' records. As we've discussed in the past, when Singleton's Plantation release of Harper Valley P.T.A. 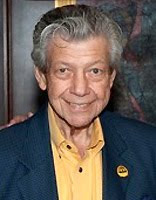 became an absolute phenomenon in late 1968, it paved the way for his purchase of Sun Records from Sam Phillips the following year. Shortly after that, he bought up the Blue Cat and Red Bird masters from George Goldner, and continued in that vein, building up an incredible catalogue of great music that he was able to sell and resell over the years. An astute businessman, he presided over his Sun Entertainment Corporation right to the end. Well loved by all who knew him, Shelby S. Singleton's incalculable contributions to American popular music will live on forever. started thinking about Halloweens past tonight & realized that this Saturday is the 50th anniversary of my Grandpa Register's death. He was a conductor on an ACL train called The Judy that went to Bainbridge & Chattahoochee. Seeing Grandpa in the casket was the only time I ever saw my Daddy cry but after that was over Daddy took me on the Insider's Tour of Johnson Funeral Home on North Foster. Talkin' 'bout HALLOWEEN! He showed me where his gang stacked wooden formaldehyde crates up so they could climb up & look into the embalming room whenever somebody important was being prepared. spent all afternoon rockin' down @ Little Willies with the Alabama Blues Project Blues Party. The bar was closed ( got no hassles for bringing my miniatures) so the kids could attend and perform. Great vibes with superb art on display. What a wonderful way to raise money for a worthy cause~ The Alabama Blues Project: Bringin' The Blues To The Young & The Young @ Heart! came up with this little joke tonight,"Who was more afraid, other than the Tuscaloosa Police Department, that Bama was gonna lose the game today?" Answer~"The restaurant owners!" "WE GOT IT BY THE SKIN OF OUR TEETH!!!!" found an article tonight containing images of letters mailed with Confederate postage to Mail Route 1538 which was between Marianna and Campbellton. According to documents in the National Archives, my G-Great Grandfather, John Young Register of Geneva, had the contract to deliver the mail along this route in 1861. This was the road that the Yankees took before the Battle of Marianna. bought a little book @ the Ft. Pickens' Gift Shop Thurs. that charged me to fulfill my destiny. The book by George F. Pearce is called PENSACOLA DURING THE CIVIL WAR~ A Thorn in the Side of the Confederacy. If the Good Lord lets me, I'm gonna write a story about how the U.S. building Ellicott's Mound #381 in Houston County in Aug. 1799 ABSOLUTELY started all the Seminole Wars which lasted all the way up to the Civil War. The other story I wanna write is about MY PEOPLE during the Civil War.